Southampton XI: Stekelenburg, Cedric, Fonte, Van Dijk, Bertrand, Steven Davis, Wanyama, Mane, Ward-Prowse, Tadic, Pelle,. 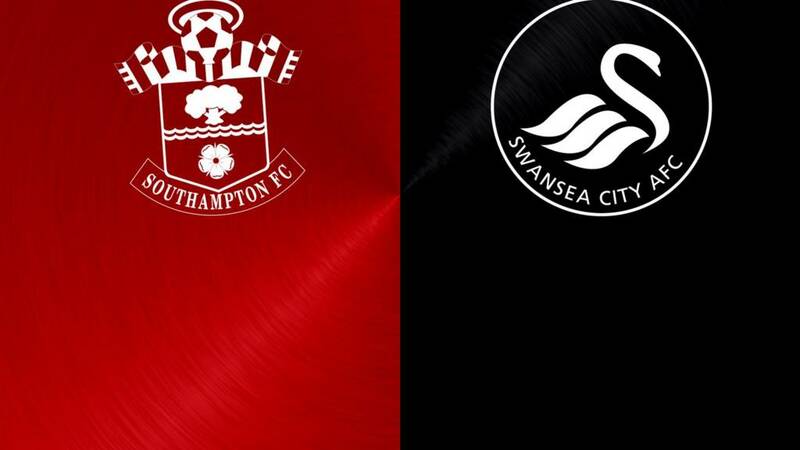 Swansea XI: Fabianski, Naughton, Fernandez, Williams, Taylor, Ki, Shelvey, Cork, Ayew, Sigurdsson, Gomis. Southampton's Graziano Pelle should have got on the scoresheet, but scoops over from 10 yards. He looks spent to be fair. Swansea's Andre Ayew, who has been very quiet, leaps up to send a stooping header goalwards - sadly for him Maarten Stekelenburg was fully behind it. Iceland international Gylfi Sigurdsson slams his effort past Maarten Stekelenburg. Too little too late surely? Surely? Neil Taylor is brought down by Jose Fonte in the area. Oriol Romeu is booked for hauling down Eder. He didn't need to make the challenge. Boredom must have crept in. Swansea's Jonjo Shelvey comes off and is replaced by Leon Britton. Swansea's Jonjo Shelvey goes into the book for bringing down Virgil van Dijk. Fair. Dusan Tadic, 'scorer' of Southampton's second goal, comes off and is replaced by Jay Rodriguez. Jose Fonte makes a great block with his foot to deny what looked like a low goalbound shot by Jonjo Shelvey. Southampton have been defensively very good. Lukasz Fabianski comes to Swansea's rescue again. Graziano Pelle's glancing header from a corner is pushed away by the alert keeper. The away players and fans are no doubt thinking of the coach home. Dusan Tadic almost makes it four for the Saints with a 25-yard free-kick that Swans keeper Lukasz Fabianski does well to cling on to. I think number four is coming. Sadio Mane scores his third goal of the week, following his double against MK Dons in the League Cup, with a well-placed low effort. Graziano Pelle's attempted shot came off the boot of Ashley Williams and fell into the path of the Senegal attacker. Lovely finish. Quote Message: Southampton have just been the better side. That goal was a bit lucky but Pelle played it in, and Tadic at the by-line saw it deflect over the goalkeeper and it's in the back of the net. Southampton have just been the better side. That goal was a bit lucky but Pelle played it in, and Tadic at the by-line saw it deflect over the goalkeeper and it's in the back of the net. What now Swansea manager Garry Monk? You've already twisted by making a double change. Just one of those days Swans fans? Was it Dusan Tadic's goal? Saints manager Ronald Koeman won't care. Graziano Pelle plays a lovely lofted ball into the left-side of the area for Tadic who runs towards the six-yard area and attempts to pull the ball back for Sadio Mane - instead the ball deflects in off Ki Sung-yueng's leg. Methinks it'll go down as an OG. Substitute Eder has a sight on goal from 20 yards. He lines up his shot. He pulls the trigger. He finds Portsmouth. Southampton back on the attack. This time James Ward-Prowse's header of an awkward ball floats wide. Harmless. Jefferson Montero and Eder come on for Bafetimbi Gomis and Jack Cork. Appears to be more of a tactical switch by manager Garry Monk than anything else. The players are back out, and Swansea are about to make substitutions. What do you think of the match so far? Disappointed with your team Swans fans? And do you think luck will finally go your way today Saints? Roger East blows his whistle for HT. Southampton on top through Virgil Van Dijk's first goal for the club, but Swansea haven't really got going yet. What will Garry Monk say to his men during the break? Saints keeper Maarten Stekelenburg is off his blocks to clear the ball played into the path for the marauding Bafetimbi Gomis. Do the Swans have a Plan B? Plan A hasn't worked so far. Southampton's Victor Wanyama goes into the book for pulling back Gylfi Sigurdsson. He's a bit unlucky to get a yellow card because it hasn't been a dirty game. Nordfeldt can sit back down. There are seven minutes remaining until HT. Saints striker Graziano Pelle is flagged offside as he is played in by Sadio Mane. In Pelle's attempts to get the ball he collides with keeper Lukasz Fabianski, who needs a bit of post-collision injury attention on the pitch. Kristoffer Nordfeldt is warming up. Southampton back on the attack again. Sadio Mane tries an effort from 20 yards that Lukasz Fabianski easily collects. A gentle jab into the body, if anything. A cross comes in from the left and Graziano Pelle, looking for his fifth of the season, flicks his header over from 12 yards. Actually, if they show the chance on Match of the Day later, some of you lot will probably say it wasn't really a chance. Swansea are seeing a lot more of the ball now. Can they get a goal before half-time? We are 15 minutes away from a cuppa. Gylfi Sigurdsson fires over, but his free-kick takes a deflection and goes out for a corner which... comes to nothing. Swansea finally return to the Saints area after a sabbatical or something. Maarten Stekelenburg is forced into making a low save to deny Ki Sung-yueng from 20 yards. Swansea now have a free-kick from 18 yards. By the way, there have already been five goals scored in the (15:00 BST) games - follow the other games in the main live text. Quote Message: I think Gomez switches off and Van Dijk climbs up to get there. It's a good bit of business to bring him from Celtic. This has the makings of a great game today. I think Gomez switches off and Van Dijk climbs up to get there. It's a good bit of business to bring him from Celtic. This has the makings of a great game today. Southampton are playing some fantastic football on the deck. Swansea have not been able to get into the game. Ryan Bertrand and Dusan Tadic have been working really well for the Saints down the left. It was coming, but it was a case of who would score first. First blood to Southampton. Virgil van Dijk, a summer signing from Celtic, arrives at the near post like a steam train to head in James Ward-Prowse's corner from the left. Sadio Mane screws half-a-foot wide from six yards out after the Swansea defence fail to clear Graziano Pelle's through-ball. Efforts on goal stats are already totting up. Swansea midfielder Jonjo Shelvey launches a stinger towards keeper Maarten Stekelenburg who punches away. Ki Sung-yueng scoops over with the follow-up. What a great start to the game. Wait a sec. Southampton's Graziano Pelle attempts a shot from 16 yards but fails to connect. Moments later Sadio Mane, who scored twice in the 6-0 League Cup win over MK Dons, fires over from the edge of the area. Poor effort really. A lot of keep-ball by Swansea in the opening few moments. Good start by the men in the..er... green and blue hoops. Swansea get the match under way. Quote Message: Southampton showed more than enough against Manchester United last weekend to indicate that they will soon rise up the Premier League table from their current position just above the bottom three. Saints will join Swansea on nine points if they defeat the Welsh team but, given that the away side have won the last three meetings between these clubs, a home triumph is far from guaranteed. Southampton showed more than enough against Manchester United last weekend to indicate that they will soon rise up the Premier League table from their current position just above the bottom three. Saints will join Swansea on nine points if they defeat the Welsh team but, given that the away side have won the last three meetings between these clubs, a home triumph is far from guaranteed. The teams are out - we are about three minutes away from kick-off at a wonderfully sunny St Mary's. No cliches of "it's always sunny on the South Coast". Maybe. Of course, we've moved on from those heady days - the Saints have a new 'Beattie' in Graziano Pelle, who's already got four goals this season. The Swans' key weapon is Bafetimbi Gomis. Ex-Southampton striker James Beattie has been out warming up with the players. The big man is now, as many of you know, first-team coach at Swansea. Below is a reminder for Saints fans of Beattie's shooting action. Nice. The away side has won 1-0 in the last three Premier League meetings between these sides. The last six league encounters between Southampton and Swansea have produced just seven goals. Southampton have only won two of their last 12 Premier League matches (D4, L6). Saints have made a league-high 131 crosses from open play this season. Swansea have conceded just three goals in their last five Premier League games. But they have failed to score in their last two league games. They last went three without scoring in May 2013 under Michael Laudrup. You've seen Lawro's prediction for this match - now have a go yourself. Some stats coming up to help you make your decision. Southampton are not the team they were last season but I still saw a few signs in their defeat by United that they are heading in the right direction. Swansea were a little bit fortunate to get a draw with Everton, who made the better chances. The Welsh side did not really test a young Toffees defence and I am backing Saints to get the points. Full-back Ryan Bertrand makes his first league start for the Saints. Right-back Cedric also comes into the starting XI along with Steven Davis. Swansea make one change to the side that drew 0-0 with Everton. Midfielder Ki Sung-Yueng returns to the starting line-up with Jefferson Montero moving to the bench. I have team news coming right up. With only one win in their first six league games, Southampton have made a surprisingly average start to their campaign. It's a principle that has proved more fruitful for Garry Monk's men who have lost only once and picked up two wins along the way - against Manchester United (impressive) and Newcastle (standard). This match promises to be a little gem.